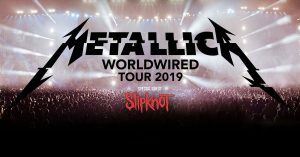 Cementing their reputation as the powerhouse of hard rock, all tickets for METALLICA‘s WorldWired Tour Melbourne show have now sold out. Due to continued overwhelming demand a 2nd & final Melbourne show has been added, to be played at Marvel Stadium on Thursday, October 24. Last here in 2013, Metallica’s long-awaited return Down Under will now extend to six Australian stadium shows on their WorldWired Tour, with no further shows possible. These dates are Metallica’s first ever headline stadium plays in Australia and New Zealand and take theWorldWired Tour past 130 stadium shows played since 2016. Tickets for the final show go on general public sale at 2pm Tuesday, April 9, with presales starting from Wednesday, April 3 at 1pm. Special guests Slipknot will appear on all dates. Tickets for this final Melbourne show go on sale to the general public Tuesday April 9 at 2pm. Fan Club Presales begin tomorrow, April 3 at 1pm. American Express Card Members are also among the first with access to tickets, with a presale beginning this Friday, April 5 at 1pm. Visit amexinvites.com.au for details. Tickets for all other shows are on sale now. For further details visit: livenation.com.au. The Wherever I May Roam Black Ticket will be traveling to Australia and New Zealand as well: one ticket allowing floor access to any Metallica show on this run. Black Ticket holders need only choose the show(s) and make an online reservation no less than 48 hours before the gig. A limited number of these Black Tickets* will be available for $598, more info here: CID Entertainment. And once again, all tickets will include a free MP3 download of the show(s) attended, mixed and mastered by the team behind Hardwired…To Self-Destruct. The free full-show downloads can be obtained by scanning or entering the barcode from that show’s ticket stub at LiveMetallica.com/scan. Enhanced experience options will also be returning in partnership with the team at CID Entertainment: three options of special enhanced experiences, including premium tickets and amenities ranging from early access to the venue and the “Memory Remains” traveling museum to meeting members of the band. Visit CID Entertainment for full package details. *Wherever I May Roam Black Tickets are non-transferable and if re-sold will be revoked. Each ticket is good for entry to Metallica specific shows and may not be used for festivals, promotional shows, benefit concerts or any other dates not included in the seven-date tour announced on March 8, 2019. Use of a Black Ticket will require an online reservation for each show you plan to attend no less than 48 hours in advance. More details about how to use your Black Ticket will be sent to purchasers via e-mail. **Every ticket purchased through official outlets includes your choice of a standard physical or standard digital copy of Hardwired…To Self-Destruct. Fans will receive an email from their ticketing agent with information on how to redeem their albums. Full details of how you can gift the album, should you have already purchased it, will be given on the redemption page.